Another NYC highlight this past week was Kelly giving me, Daniel, Steph (Reviewer X) and Nicole (Linus's Blanket) a tour of Hachette's offices on Monday morning. Kelly took nearly two hours out of her day to answer our questions and show us around. Thank you to Kelly and the whole online team at Hachette. You are doing a great job reaching out to bloggers. 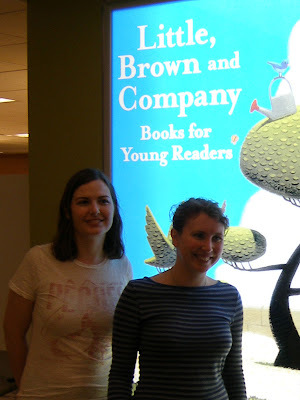 Our first stop was to visit Alice in the Little, Brown Young Readers division. I can't tell you how cool it was to see her desk piled high with ARCs of HATE LIST, ASH and PROPHESY OF THE SISTERS (all spoken for). No stack of BEAUTIFUL CREATURES because they went superfast! She told us a bit about her job and that she gathers up ARC requests and then deals with them all at once about once a week. She loves digest e-mails, so if you owe her links to several reviews, it is best if you wait to send them all at once. We walked around and looked at a couple of the other departments and imprints, with Kelly telling us about what they do. And of course, she had to show us the ARC closet that Brianne recently organized. I am sure I squealed when I saw it. Kelly showed us Hachette's video studio and then took us to a whole different floor to check out Hachette's in-house, state-of-the-art audio recording studio where actors and authors come in to record audio books. Hachette is very pro-book blogger and were very early adapters in online marketing. They are both amazingly accommodating and genuinely thrilled to be working with us. They've set up a platform on ning where book bloggers can sign up to host a Hachette giveaway and another platform where book bloggers can request upcoming titles for review. Look at all those wonderful books! What an amazing opportunity you had to get an inside look at how it all works. Color me jealous but so happy for you guys. Wow that is awesome! I'm totally jealous you got to do that! And you met Alice! That's totally awesome!! :) And is that Alice Morley? Great pics and recap- I'm jealous! Sounds like such a fun time! ARCs of Ash! *pines* I'm really looking forward to that one. Thanks for sharing the pics. Sounds like it was a great experience! That is really, really awesome. I'm jealous! So neat - thanks for sharing the pics. It's great to put faces to these wonderful gals we work with every day. This entire post is just so so cool! Wow, that looks like a fantastic time! That is incredible. And I am, obviously, dying of jealousy over that ARC closet. That is really cool! I loved getting to see the behind the scenes photos of Hachette! That sounds like such a great time. I'm so glad you guys got to go! I'm sorry I missed the tour! Hachette is so wonderful to work with and I loved meeting all of them last weekend. Thanks for posting this. That looks like it so was soo fun. Hopefully I can go next year. Now I want a book closet! OH! I want to go there! That looks soooo cool! How cool! Love the ARC piles. That looked like a really fun time! It would be so cool to sit in that audio booth. And you met Alice! She's wonderful! Thanks for posting this, I've always wanted to see what the inside of a publishing house looks like. 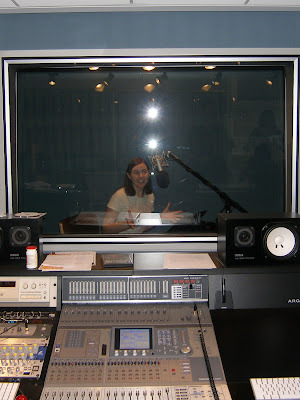 And loved the picture of you showing what it would look like if you were recording an audio book! hehe! Love the pictures.. thanks for sharing. What a great time. I am soooo jealous. Thanks for sharing your tour with us! 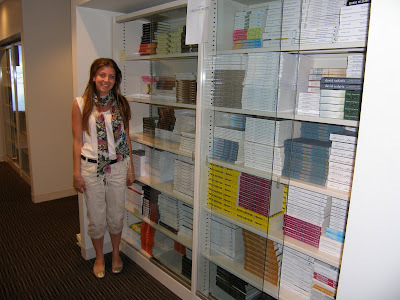 It was so nice to see the "behind the scenes" at Hachette and faces of the wonderful women that support book bloggers. The ARC closet and audio booth were my favorites!! What a wonderful trip that you had in NYC! What a treat it was reading all about your tour! It looks like you had a wonderful time! Hachette really is great when it comes to working with bloggers. And I'm so jealous you met Miriam in person, I used to talk to her a lot this past year. You probably wouldn't have been able to drag me away from the ARC closet. Totally off topic, but Steph and I own the same pair of shoes. I'm so jealous of you guys. How did you get such a great tour like that? I'm so glad to see Alice, she's been so nice on emails and stuff. And look at the ARC closet! Anyone else wants to be book thief? Loved all of those pictures!! and especially the ARC closet..I could hear your squeals of delight from here!! That's totally awesome Lenore! I love Hachette-they really are great. What fun! I have to admit I was green with envy when you guys made your plans at dinner. I love the Hachette team...they are wonderful. Oh I loved the pictures. Thanks for sharing. Looks like you had so much fun. I'm living vicariously through you! what a great post. 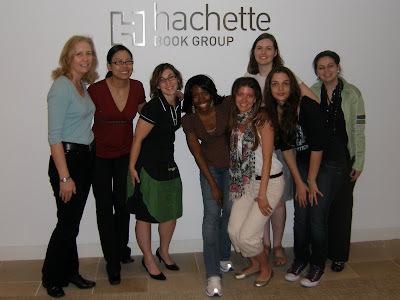 i love all the girls at hachette and it's wonderful you got to tour the place...SO jealous! How fun!!!!! I have to spend more time in NYC next year. Wow. That's neat. That'd be something I'd love to do some time. *drools* look at all the ARCs. You are very lucky! What a great opportunity for you. Way cool! I love the bit I've done with the Hachette team, so I'm glad to hear they were awesome in person. Thanks for this fantatic post! 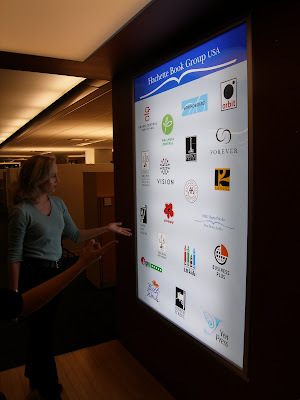 Hachette is just the best and I was sooo envious that you gals got a tour. But this post is almost as good as being there! An ARC closet! That is awesome. I can't wait to read ASH. Oh I loved this post!! How lucky you are and how jealous I am that you got to meet all the great folks at Hachette and tour their offices!! Cool beyond belief. Thanks for sharing!! Thanks for the inside look and all your BEA reports. Looks like a ton of fun! When I visit NYC again I would love to spend some time visiting with the amazing people at the publishing houses that I've been working with! I enjoy reading your blog, Lenore! 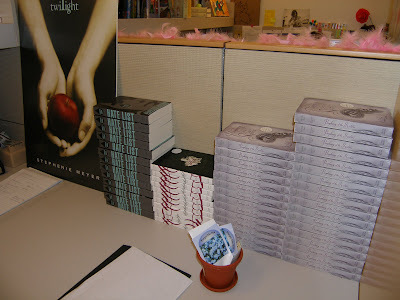 And this post about the Hachette Books Tour is just awesome! Oh Bookworm, I did not get ALPHAS. I'm not sure I even saw it, but then I wasn't on the lookout for it. supercool! thanks for sharing this hachette experience. That looks like so much fun! and what an awesome experience! Definitely learned a couple new things! This is such an awesome post! Thanks so much for sharing the pics from your tour - that is something I would love to do. I think it's pretty cool that the recording studio is in the same building. Very cool behind-the-scenes tour complete with photos ... thanks for posting this! I can't decide which pic I like the best - the group shot in front of the Hachette sign, the ARC closet, or you in the recording studio! That's so cool - I work with Miriam & have worked with Anna - neat to see them. What a great experience for you!